Personalised Peter Rabbit Gifts. These Peter Rabbit gifts make an ideal gift for a little ones special occasion. From the classic Beatrix Potter books these adorable Peter Rabbit booties are made from super soft plush. With cute embroidered features and a rattle in each toe. Watch your baby discover the sounds in their feet and the joy on their faces. As they develop their gross motor skills and learn how to make them rattle. To add a personal touch, you can add their name along the side of each bootie. This gift comes finished in a cute little gift box to make a perfect present for new-borns. Box (HWD): 13 x 14 x 8cm. Name max 15 characters including spaces. Make mealtimes fun and practical with this Peter Rabbit dinner set, Can be used anywhere. & makes perfect gifts for children, or even christening gifts. This fresh and natural, eco-friendly dinner set includes:. A plate: 21cm, Bowl: 14cm, Cup: 9cm and cutlery. Not recommended for microwave use. Suitable for ages 18 months+. Excerpts from Beatrix Potter’s original tales, along with the original illustrations, are brilliantly teamed with frank and witty advice. These books can be personalised with any name & message. Each of these books can be personalised with their name on the front & on the header of each page. And with a personal message can also be included on the opening page. These books are presented in a beautiful gift box embossed with a Peter Rabbit design. The Peter Rabbit Little Book of Harmony. A life of harmony is a constant trade-off between behaving as you wish and offending your friends. The Peter Rabbit Little Book of Harmony brings a new twist to the original stories of Beatrix Potter. Written in the language of Potters time, this advice, when read in the modern day. Results in a brilliant balance of sarcasm and food for thought. Covering popular topics such as family. Romance, marriage and friends theres advice for every situation. Theres even advice on loving thy neighbour. The Peter Rabbit Little Guide to Life Book. The Peter Rabbit Little Guide to Life teaches Manners, morals, entertaining, housekeeping. And common sense all of which are cleverly commented on. Those that love the original tales will enjoy reading the lessons in morals given. The Peter Rabbit Little Book of Virtue. As stated in the foreword of this book virtue has become an endangered species. And society has yet to give it protected status. Through thinly veiled sarcasm, advises perfectly how to navigate common scenarios. Whilst remaining a pillar of virtue. House hold hints are presented along with tips on keeping moral ground. High society, dinner dates, and good old common sense are also covered. Message line 1 max 40 characters including spaces. Message line 2 max 40 characters including spaces. These adorable pair of Peter Rabbit bookends would make a beautiful addition to any room. Add a message of up to 15 characters onto the base of each of the ends. Crafted from quality rubber wood, these bookends will hold your favourite books in place. Dimensions of each end: H: 14.5cm W: 13cm D: 10.5cm. Message line 1 max 15 characters including spaces. Message line 2 max 15 characters including spaces. Book & Plush Toy Gift Set. This Guide to Life book contains some of Beatrix Potter’s most loved characters. And is a witty, humorous read that combines passages of text from the Victorian author’s well-known tales. With sage advice and life lessons. This book can be personalised with any name & message. Alongside the book is an adorable Peter Rabbit plush toy. The perfect companion for those bedtime readings. This charming set is presented inside an ivory coloured, deep A4 gift box. Making this a truly exceptional and memorable gift that will be treasured by its recipient for years to come. Weight given is for the book and toy in the box. Dimensions given are for the box. Toy on its own = 95g, 300 x 90 x 110mm. Book on its own = 480g, 200 x 202 x 12mm. Comforters Blue or Pink. From the classic Beatrix Potter books this beautiful Comforters are made from premium soft plush to. Ensure that it is as gentle against babies skin as can be. Your personalised message over 3 lines will be embroidered on the white side next to the Peter Rabbit Logo. These comforters are machine washable so can be taken everywhere with your little one and restored to new with a quick wash! Dimensions: H: 10cm, W: 30cm and D: 30cm and suitable from birth. Message line 1 max 30 characters including spaces. Message line 2 max 30 characters including spaces. Message line 3 max 30 characters including spaces. This compact wooden Peter Rabbit Domino set is an ideal gift for all children. Personalise with your choice of name to be printed along the side of the storage box. Dimensions H5 x W17 x D10cm. My 1st Peter Rabbit Plush. This adorable my first Peter Rabbit plush is an ideal gift for Newborns! Personalise with your choice of name to be printed along the body of the toy. Dimensions H31 x W20 x D10cm. Take Peter Rabbit for a walk! This Peter Rabbit plush toy is set upon wooden wheels with a pull along cord. Personalise with your choice of name to be embroidered along the body of the toy. Your required personalisation will appear in the Font style & text as shown in picture eg upper or lower case. Accents and other symbols cannot be printed! 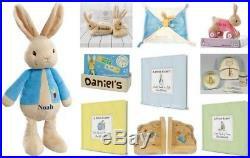 The item “Personalised PETER RABBIT Gift Ideas For NEW BORN Baby Boy GIRLS CHRISTENING” is in sale since Wednesday, June 6, 2018. This item is in the category “Baby\Christening & Gifts\Christening\Gifts”. The seller is “beesgiftstore*” and is located in Waterlooville. This item can be shipped to United Kingdom, Austria, Belgium, Bulgaria, Croatia, Cyprus, Czech republic, Denmark, Estonia, Finland, France, Germany, Greece, Hungary, Ireland, Italy, Latvia, Lithuania, Luxembourg, Malta, Netherlands, Poland, Portugal, Romania, Slovakia, Slovenia, Spain, Sweden, Australia, United States, Canada, Brazil, Japan, New Zealand, China, Israel, Hong Kong, Norway, Indonesia, Malaysia, Mexico, Singapore, South Korea, Switzerland, Taiwan, Thailand, Saudi arabia, South africa, United arab emirates, Ukraine, Chile.